Louis C. Simon Jr. passed away quietly Friday, April 25, 2014, surrounded by his family, in the Lincoln County Care Center, of natural causes. Louie was born in Omaha, Neb., on Sept. 4, 1925. He attended public high school in Omaha and went on to attend college at Creighton University. After a stint in the U.S. Navy during World War II on the GI bill, he continued his education at the University of Nebraska, eventually graduating with a degree in Architecture. 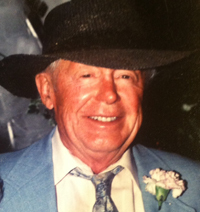 Soon after graduation, Louie moved west, coming to the Sun Valley area on the Union Pacific railroad in 1948. Once he saw the majestic Idaho mountains he never returned to Nebraska. Working at the Duchin Room and the Sun Valley Lodge room service, waiting on his favorite movie stars and hanging out in Ketchum in the early days were some of Louie’s most cherished memories. He briefly opened and ran his own business, “Lou’s Lair,” on Main Street in Ketchum, next to the Casino. He sold contemporary art, sheet music, greeting cards and more. He hired an employee so he could be out enjoying libations with friends at the Alpine and the Casino. Louie bought a little piece of heaven on Warm Springs Road and built his dream house with his favorite view in the world of Baldy. He met his future wife, Mary Bowden, in 1952, eventually marrying her in 1956 at St. Charles Church in Hailey, Idaho. In 1958, they moved to Reno for Louie to start his teaching career at Central Junior High School, where he taught art and math until it closed. He then moved on to Swope Junior High, where he continued teaching art. He was a respected and beloved teacher for 32 years. While teaching, he returned to school himself at the University of Nevada-Reno, where he received his master’s degree in Education. At the end of every school year, Louie and Mary and their four children, dogs, cats and all would return to Ketchum each summer to our favorite little house on Warm Springs Road. After Louie retired in 1990-91, of course there was no question where he would spend his retirement. He came back to his home here where he basked in retirement bliss. He began traveling during the winter months to Mexico and Arizona until his early 80s. After his traveling ended, he spent his time in Ketchum enjoying a coffee and cookie at Starbucks, visiting with friends, or shopping at the Gold Mine and Atkinsons’, all while wearing his signature hats. Louie loved music, old movies and art. His passion was ceramics and contemporary and abstract art. For years and years he made hand-made Christmas cards for our many friends and family. Each was its own mini work of art. He was a wonderful joke teller with a wicked sense of humor, a master of the English language (he wouldn’t hesitate to correct your grammar), he often quoted poetry and Latin, and he loved to sing and dance. He was a member of Phi Beta Kappa Academic Honor Society and of the American Legion. Louie and Mary had four children and six grandchildren. Louie was a true original. He was deeply loved by his family and he will truly be missed. He is survived by his wife, Mary Bowden Simon; his children Mark Simon, Craig (Alicia) Simon, Mimi Simon, from Reno, Nev., and Patty (Ben) Gilman, from Bellevue, Idaho; his grandchildren Louie May, Britt, Maddy and Kennedy Simon, and Quin and Avery Gilman; his sister Joyce (Tom) Cook of Reno; his dear friend Robert Hansen; and his faithful dog, Zach. He was preceded in death by his parents, Louis and Retta Mae Simon, and his siblings, Ted and Dorothy. Thank you to everyone who helped care for my Dad, in and out of his home over the past year, especially the kind and caring staff at Lincoln County Care Center. Services are planned for 2 p.m. Friday, May 2, 2014, at St. Charles Catholic Church in Hailey. Please call Wood River Chapel at (208) 788-2244 for information or go to www.woodriverchapel.com. You may also leave condolences, share memories and pictures, and light a candle.